Introducing a new fun educational children's program from Colombia. Meet Guilhermina and Candelario! The siblings live on the shores of a beach in their grandparents's house, spending their days playing, discovering new things, and finding creative solutions to problems. 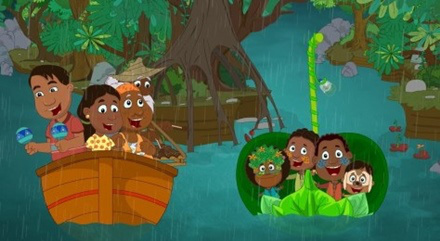 Though the show is from Colombia it has received massive support from families in Brazil, as there is very few Brazilian cartoon shows with black leading characters. The show can now be watched on the Hora da Criança (Children's Hour) , which airs on Monday to Saturday morning on TV Brasil. Here is what some kids had to say about the show at a launch in Salvador. Posted on November 3, 2015 by Adamu Waziri and filed under Black Kids Cartoon, Fun Stuff and tagged afro Colombian Kids show educational cartoon.